Since posting Active Directory SSIS Data Source I've received a few requests for the package. And I always felt bad because there wasn't a nice way to say change, these N things from my copy and it'll work for you and here's a copy for 2005, 2008, 2012 and now 2014. Egads. Fortunately, there's a new tool in my toolbelt called Biml and it's awesomesauce. Open Visual Studio, create/open an Integration Services project type. Right click on the project and select "Add New Biml File"
In your project's Miscellaneous folder, double-click the BimlScript.biml file and paste the following content into it replacing the file's content. Edit line 6. Replace HOME.BILLFELLOWS.NET with the name of your domain controller (DC). To determine your DC, from a command prompt, type set | find /i "userdnsdomain"
J:\Users\bfellows>set | find /i "userdnsdomain"
Edit line 46. Replace LDAP://DC=home,DC=billfellows,DC=net with the path to the domain controller. Follow the pattern and you should be fine. 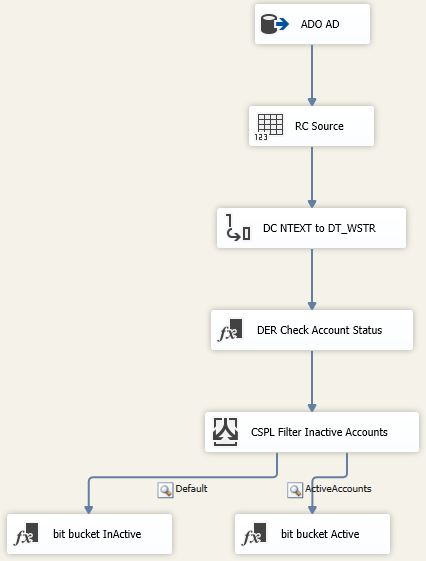 Right click on the BimlScript.biml file and choose "Generate SSIS Packages"
Provider="System.Data.OleDb.OleDbConnection, System.Data, Version=4.0.0.0, Culture=neutral, PublicKeyToken=b77a5c561934e089"
Description="AD accounts that are deactivated"
The original limitations still exist. The next post of this will have the script task included to generate group membership. The final installment will use a .NET script source to provide an alternative to the limitations of the query route.